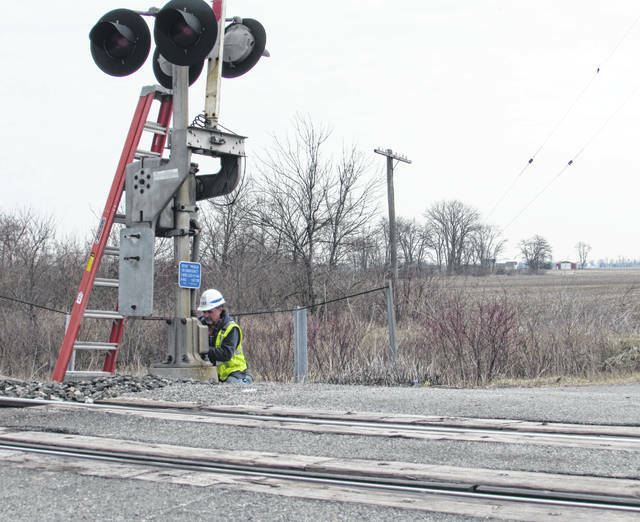 A CSX Transportation employee works on what he called “a yearly safety inspection” on the railroad crossing at Road O and state Route 65 in Putnam County. A train crashes into a truck stuck atop the railroad tracks in Putnam County, Ohio. COLUMBUS GROVE — A steep incline leading up to a railroad crossing is being blamed for an accident involving a cattle truck and train Thursday, resulting in the deaths of 29 cows. According to Putnam County Sheriff’s Office Deputy Greg Westrick, who was at the scene, the truck became stuck when the trailer bottomed out at the crossing on Road O near state Route 65 in Columbus Grove. The crossing has a steep incline leading up to it. “I am not aware of there being any issues before at the crossing,” Westrick said. He was at the scene Friday with a CSX Transportation doing an inspection on the crossing. Jeremy Gerten, owner of the Gerten Deadstock company in Leipsic, said the cows were trapped in the trailer. Some were still alive and had to be put down. “It was a pretty sad sight to see as far as the animal’s sake. Everyone conducted themselves very well,” Gerten said. The train did not hit the truck with enough force to cause the cattle to come out of the trailer. “We pulled all 29 of the cattle out and hauled them back to our facility to get them ready to be processed,” Gerten said. The meat will go to GA Wintzer & Sons, a rendering plant in Wapakoneta. It will not be used for human consumption. Wintzer & Sons will process the meat and make byproducts out of it. There was an estimated 35,000 pounds of meat that came from the cattle, according to Gerten. Gerten said his company has been on scene previously for trailer rollovers where pigs were involved and this is the second time the business received cattle to get ready to process from an accident. Gerten Deadstock brought its trucks to take the deceased cattle away. The truck and trailer involved in the accident was towed by Meyers Truck Company, Glandorf, and the train was taken off the track. The accident occurred at 2:15 p.m. Thursday. The driver of the semi, Kyle Shroyer, 33, of Danville, Indiana, was able to get out of the truck before it was hit. State Route 65 was closed for more than five hours before reopening at 8 p.m. Thursday. The train was traveling southbound carrying steel. No citations were issued in the accident as the truck driver was not breaking any laws, according to Westrick. The train did not derail at any time and there were no reports of hazardous materials on the train. It is unknown how fast the train was going, but there was a video taken by a driver that showed the train trying to stop before it hit the semi and went into emergency lock down, Westrick said. Law enforcement, Columbus Grove fire department, veterinarians and animal dealers worked together Thursday to make sure the 29 cattle who were killed in a accident were cared for and the scene was safely cleared. The accident is still under investigation and law enforcement will interview the parties involved. Video Caption: A train crashes into a truck stuck atop the railroad tracks in Putnam County, Ohio.